Take a few moments to check out our Welcome Home brochure. 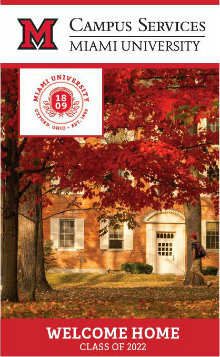 This is a great resource full of details about Campus Services and living on campus. Welcome to Miami University Housing! Through our partnership with the Office of Residence Life, we seek to ensure that your home away from home is safe, comfortable, and clean—and that it supports your education and personal growth. We have an array of housing options on campus to meet the diverse needs and interests of our students. Miami requires first and second year students to live on campus, and also provides a limited number of spaces for third and fourth year students each year. From our traditional corridor residence halls to apartment-style living, there’s something for everyone. Room Selection for current First Year students (rising second year students) starts soon! Learn more! Our online housing portal is your source for room selection, housing assignments, meal plan changes, and more. Use the link below to access MyCard if you have a need to request Break Housing.